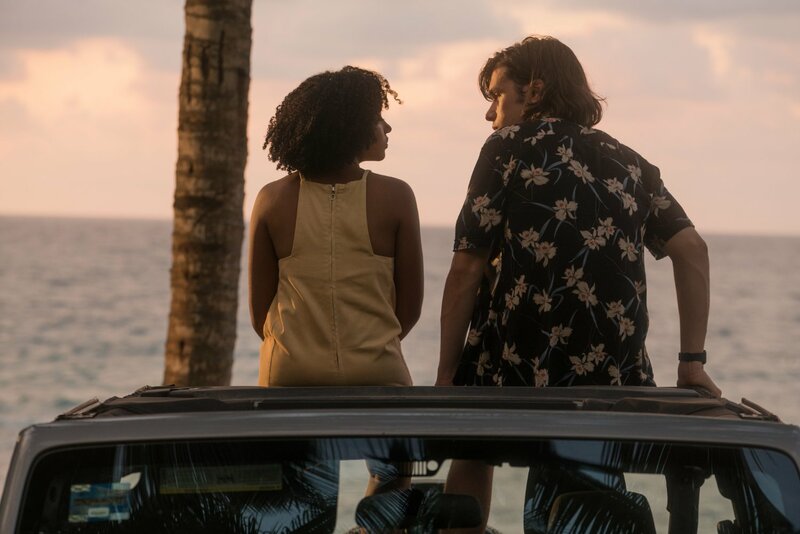 For a film about an unforgettable romance the worst crime Everything, Everything commits is not exactly searing itself into the minds of viewers as such. 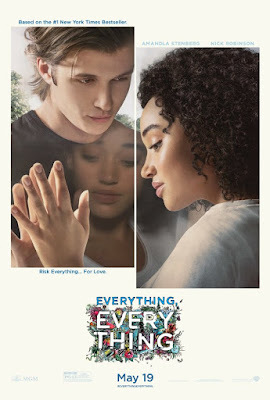 Everything, Everything is a fine enough teen love story, but it is also a very slight love story-never allowing us to become invested in the characters or passionate enough about their plight as it seems we should. Moreover, the film does this to itself as it very well could have allowed more time and dedicated more of that time to developing why our two leads do indeed fall head over heels for another. Alas, at only ninety-six minutes Everything, Everything only has so much space to divulge the complexities of our greatest of virtues. That isn't to say the film doesn't make good use of the time it does spend on our star-crossed lovers, but only that we get to the inevitable rather abruptly (which might otherwise be admired) leaving the remainder of the film and the risks these characters take for one another seem all the more drastic and irresponsible which is the last thing you want when your movie positions the kids as the heroes who are smarter than the adults that surround them. The point being, as with everything, ones reaction to Everything, Everything will largely depend on the stage of life that viewer is currently experiencing when taking it in. Being a young parent, but someone who still feels at least slightly in touch with youth/popular culture Everything, Everything played with my sympathies toward the conundrum our characters face while at the same time appreciating that were this to actually occur in the real world the parents would be more rational and the stakes nowhere near as dire. Young love wants to feel a little dangerous though, a little forbidden, and slightly scary-it is what gives it that rush of excitement and uncertainty; it is what makes it all that more memorable in hindsight and it is in these details, in the minutiae of such times, that Everything, Everything actually finds its success. Director Stella Maghie and the screenplay from J. Mills Goodloe (Age of Adaline) that was of course adapted from the New York Times Bestseller by Nicola Yoon doesn't so much let her film stand on the shoulders of grand gestures or dramatic speeches, but more in the small, precise details of what makes love worth living for when you're young and want nothing more than to feel indestructible. This focus on precise over big moments allows much of the underdevelopment and lack of any real arc to (mostly) be forgiven come the end of the movie. Still, you won't remember much of it the next day. 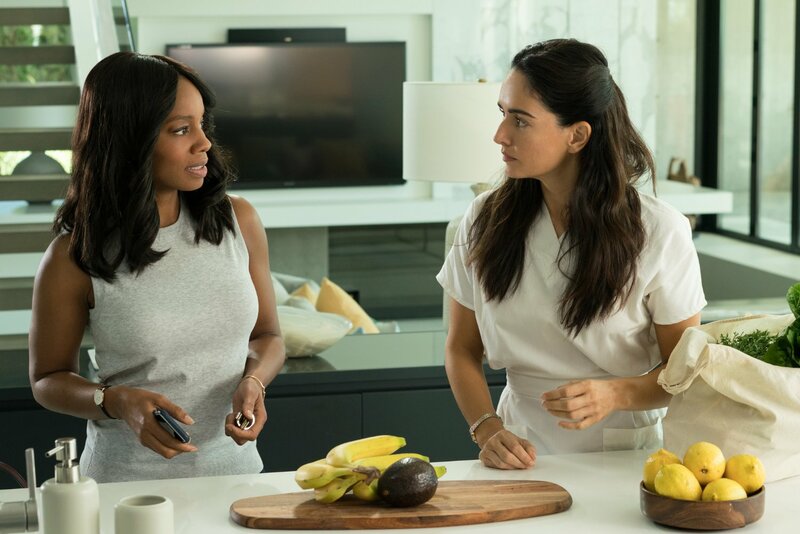 Pauline (Anika Noni Rose) and her daughter's nurse Carla (Ana de la Reguera) disagree on many facet's of Maddy's raising. Photo by Doane Gregory - © Metro-Goldwyn-Mayer Pictures Inc.
Madeline "Maddy" Whittier (Amandla Stenberg or Rue from The Hunger Games) suffers from a rare condition called severe combined immunodeficiency (SCID), meaning her antibodies are not able to properly fight off infection. She has spent the majority of her life and all that she can remember about that life inside the house her doctor of a mother (Anika Noni Rose) has made into a fortress of cleanliness. With all the latest technology and necessary adornments Maddy could essentially want for nothing and go on living a risk-free life, but of course-life happens. The only people allowed inside the house besides Maddy and her mother is Maddy's nurse, Carla (Ana de la Reguera), and her daughter Rosa (Danube R. Hermosillo). It is when new neighbors move in next door that hormones begin to rage and thus we witness Maddy rush into something as serious as her first serious relationship simply because she is desperate for something real, something palpable. Such a desire comes in the form of Olly (Nick Robinson), a self-proclaimed loser of sorts who likes to wear black (very much in contrast to Maddy's consistent all-white aesthetic) and appreciates a person with a few good vices. Things begin innocently enough as Olly is rightfully curious about the pretty girl next door who doesn't come outside and whose mom refuses Bundt cake because it didn't come from her immaculate kitchen. Olly begins by making distant meet-cute gestures from his bedroom window which is luckily just across from Maddy's. After a few days he writes his number on his window and the two begin texting. They learn what they can about one another and rather quickly decide they like one another. The flirting continues which only increases the need for each party to get more out of the other. Texting from each other's bedrooms gets old quickly; it's not good enough. Maddy guilt's Carla into allowing Olly to visit where they're still not allowed to touch, but will of course only increase that desire tenfold. Things escalate as one might expect, but despite knowing the relationship at the heart of the story will most certainly go the predictable way of a movie what we don't know is what way the fate of Maddy will go. Is Olly truly setting himself up for heartbreak or is there more to the narrative than meets the eye? As these things go, Everything, Everything is right down the middle in terms of ambition and execution. Everything here is done in competent fashion, but in a pleasant twist there are certain aspects that highlight the continually evolving way in which texting and social media are presented on screen that are intriguing on their own. These spontaneous bursts of inspiration paired with both Robinson and Stenberg's dedication to the material and making it work give the film the fresh, lightweight feeling it incessantly possesses. It is in these inspired moments that Everything, Everything is made more endearing as they are unexpected, but undoubtedly appreciated. Maghie certainly has a vision for the material she's been given and isn't content to simply sit by and let what could have easily directed itself be done in such a manner. The first instance of this comes after Maddy and Olly begin texting one another. Rather than having her two actors stare longingly at one another through glass Maghie allows them to come together at an old fashioned diner, in a booth-not dissimilar from the model Maddy has been working on as part of her homeschool curriculum. Maghie then proceeds to shoot the remainder of the conversation in this environment as if the two are not only talking face to face, but also in a dream-like state. The set is very much a diner, but it is surreal. There are still phone tones going off in the background when each character begins to speak signaling this is still only a text conversation, but to remove that barrier and convey the state of minds these two individuals must feel like they're in when talking to one another despite the obvious hurdle is what makes a viewer sit up and smile. Further down the road, Maghie again uses a technique much like Marc Webb did in (500) Days of Summer in the expectation vs. reality scene where, the second time Maddy and Olly meet face to face, the subtext of the dialogue the two are speaking to one another shows up at the bottom of the screen as if interpretations of what is actually coming out of their mouths. It's nothing that is necessarily revolutionary, but it was pre-meditated and that is visible in the performances; lending what might have been an otherwise routine scene of dialogue that aforementioned fresh, lightweight feeling. Maddy (Amandla Stenberg) and Olly (Nick Robinson) fall for one another in Everything, Everything. Adding to this tone the film carries throughout is the distinct sense of innocence it all possesses. For as old as Maddy is and as fast as things seemingly move this is still the first time Maddy is feeling many of these emotions, much less creating the opportunity for herself to experience them. Most importantly, while older audience members may condemn Maddy and Olly for being foolish in their young love, we like who these two are as people and despite what could easily be seen as faults or shortcomings-we want what is best for them. Maddy likes The Little Prince-it reminds her that, "Love is Everything. Everything." while Olly is more of a Lord of the Flies guy that needs no reminding that he can have a poor outlook on life. Given his home situation though, this is to be understood especially as Olly is in his most formative years. Maddy presents the aura of an angel whereas Olly plays to his belief in the bleak, but neither are as clean cut in their categorizations as they'd have you believe and in the romance that evolves between the two of them they seem to genuinely find the secret to love and life in one another-balance. As for the adults, none of them are fleshed out enough to matter much, but we spend the most time with Maddy's mom as Rose's Pauline is at one time written and played as a more complex character than would typically be written in such a role while at the tail end of the film resorted to such a plot device that it's hard for her to register as little more than as much. In our first real encounter with Pauline, Rose plays her as a surprisingly understanding figure than what we inherently anticipate to be a tyrannical, condescending parent. Ultimately though, she must uphold the law she has put in force and though her motivations are understandable and selfish to a degree that even teens in the audience might be able to fairly comprehend the perspective of living and actually being alive never comes across as valuable enough to justify consideration. All things considered, Pauline would have to have known the events depicted in Everything, Everything would happen eventually and that she would need to be prepared for as much. Such complications might seem slight prior to viewing the film, but afterwards such a detail is a sore thumb in the way of how the film chooses to resolve itself. The resolution isn't necessarily unexpected, but it certainly doesn't fall in line with the tone or romanticism that seemed so effortlessly expressed until it was forced to roll the credits; maybe if more time had been taken to flesh it out a more organic resolution might have presented itself. Maybe, maybe.